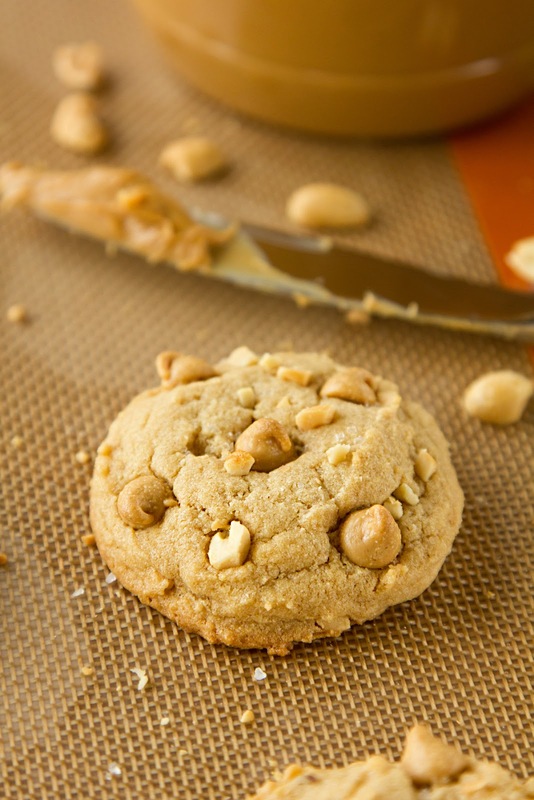 Chewy Chunky Peanut Butter Cookies - Hi, friend Popular Recipes, in this article entitled Chewy Chunky Peanut Butter Cookies, we have prepared this article well and concise to be easy to understand for you to read and can be taken inside information. hopefully the contents of the post Article baking, Article Cookies, Article food, Article peanut butter, Article recipe, that we write this you can understand and useful. okay, happy reading. Lately I've been craving any treat with peanut butter or peanuts in it- dark chocolate peanut butter cups, peanut butter M&Ms, peanut butter pretzels, rocky road, trail mix- you name it, I've probably been snacking on it! So this afternoon when I wanted to make cookies I naturally gravitated towards peanut butter ones. Instead of traditional criss-cross cookies that are often dense and crisp, I wanted ones that were soft and chewy. I turned to a recipe that I found a while back and adapted it in hopes creating the cookie I was looking for. After biting into one, I have to admit- they were a huge success! The texture is perfect and the flavor is spot on! I'd like to think that the addition of an extra egg helped to give them a chewier texture and that the peanut butter chips and large peanut chunks gave them that extra boost of peanut buttery goodness. The original recipe called for the cookies to be rolled in sugar, but I'm not a fan of the sandy texture that results, so I opted for a sprinkle of sea salt which helped to enhance the flavor even more. These are a great alternative to the traditional fork print cookies and will definitely have you coming back for more! Enjoy! 1. Preheat oven to 350 degrees. Line cookie sheets with parchment paper, set aside. 2. In the bowl of a stand mixer, beat together sugars, butter and peanut butter until smooth, about 2 minutes. With mixing speed on low, add vanilla, milk and one egg. Mix until incorporated, then add remaining egg. 3. In a medium size mixing bowl, whisk together flour, baking soda, baking powder and salt. With mixing speed on low, gradually add dry ingredients, mixing until no visible dry ingredients remain. Remove bowl from stand and gently fold in peanut butter chips and chopped peanuts. 4. Scoop dough onto prepared sheets (I use a standard size scoop), sprinkle with salt if desired. Place in oven and bake for 12 minutes- don't be tempted to leave them in longer, otherwise they'll get hard! Remove from oven and allow to cool on sheets for 3 minutes before transferring to a wire rack to cool completely. Enjoy with a large glass of milk! NOTE: To achieve the look pictured above, I sprinkled mine with extra peanuts and pressed in a few extra peanut butter chips. Thank You and Good article Chewy Chunky Peanut Butter Cookies this time, hopefully can benefit for you all. see you in other article postings.